Blue Teal Edible Luster Dust | Bakell® #1 site for glitters & dusts! 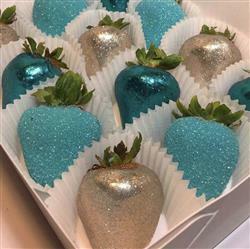 Amazing Edible Blue Glitter!! Worked PERFECTLY! The edible blue glitter I bought from Bakell was PERFECT! My glitter dipped/ sprinkled strawberries came out perfectly! I bought both their GOLD and this BLUE edible glitter — and I give them 5/5 stars! Here is a photo as well! Hope this review helps! Loved the sparkle it gave! And I didn't have to use so much! Uses the red and pearl on a 4 tier wedding cake and almost used just 2 containers! Super satisfied! This company makes the BEST Metallic Dusts! Amazing quality! and... i cant believe the prices! !